Fr. Andrew Lesko leading a parade of parishioners during the blessing ceremony of St Nicholas future home. Fr. Andrew Lesko standing on the future floor of his altar and...smiling. Fr. Andrew Lesko blessing the church cross as John Bahnson and Mary Coromelas look on. It's more than a cross and a building, it's our future home. A dream comes true after 23 years! With the blessing of our hierarch, Metropolitan Gerasimos of San Francisco, St. Nicholas Greek Orthodox Church of the Temecula Valley has purchased a building that will be the new home for our parish. The building is located at 41132 Guava Street, Murrieta, CA 92562. This is a first step for the community, which plans to build a new church on the property in the future. St. Nicholas Greek Orthodox Church serves all Orthodox Christians regardless of their ethnic origins. Services are done in English and Greek, with some prayers and hymns sung in Arabic, Russian, Romanian, and Spanish. Everyone is invited to attend. Currently services are conducted at 42030 Avenida Alvarado, Suite A, Temecula, CA 92590. Orthos is at 9 AM every Sunday and the Divine Liturgy is at 10:00 AM. Everyone is welcome to attend. Sunday School is held for our children each week after the Divine Liturgy. Greek language classes are also given on Sundays after the Divine Liturgy. Greek dance classes are offered for children and adults every Thursday evening. Other ministries include Bible study, a Senior Citizens’ group, Philoptochos, community outreach, and adult education classes. 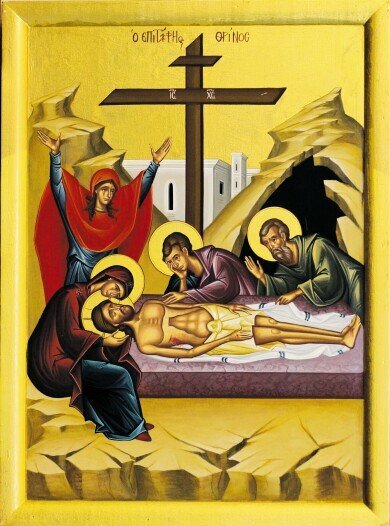 Lenten services are held every Wednesday and Friday evenings until Pascha (Easter). Pre-Sanctified Liturgies are celebrated on Wednesdays and the Akathist Hymn is celebrated on Fridays. Please call the parish priest, Rev. Fr. Andrew J. Lesko for more information at (909) 224-5046.